Dr. Bing Celebrates His 300,000 Mile Car! Okay, I’m a little weird. Why would you care if I get 300,000 miles or a 1/2 million or whatever on my car? Because if I can do it, you can, too. Transportation takes a significant chunk of all our checks and for most it’s just money down the drain. But, hey, if I only spend about $1200 a year on maintenance for the last 6 and 2/3rds years, that saves a ton of money. Compared to the average car payment of nearly $500, I’m saving a considerable amount each month (A common excuse I hear from people to go deep into debt on a new car: “I don’t want the high maintenance costs.”). Plus, I drive over 20K a year and all that does is run a car into the ground. No sense spending a lot of money on a fancy car when it’ll be worth hardly anything in a short time. Like I said on the phone last night I finally got to 300,000 miles on my Lexus. You and I have been talking about this several years, as you’d had a Buick LeSabre that had 250,000 miles on it when it was totalled in a car wreck. I’d bragged I was going to beat that and hopefully get to 300K. Well…I have! See the attached flier (to readers of the blog, see below) I made. I took it to Fix It Auto along with some donuts and a case of Mountain Dew. You should have seen the smiles on the repair guys’ faces. It was pretty fun. 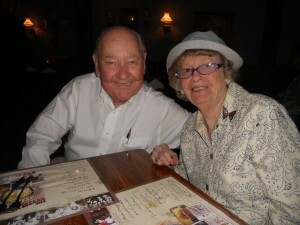 Bing’s dad and mom, Fritz and Carol Wall, a year before Fritz’s heart attack and stroke. 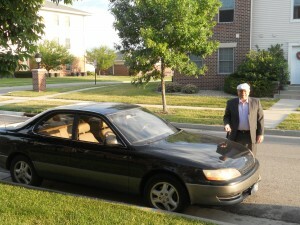 Bing Wall, Ames, Iowa, bought his 1996 Lexus ES 300 in October, 2005. At that time the car had 127,000 on it. Since then he’s had it serviced regularly at Fix It Auto in Ames, Iowa. 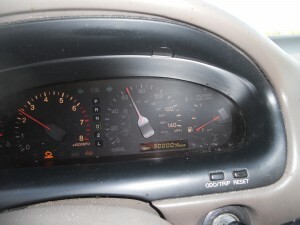 Just yesterday the odometer climbed to 300,000 on Interstate 80 as Bing returned home from work in Urbandale. I’d been anticipating hitting the 300,000 mile marker for months. And when it arrived I missed it! I didn’t see it until 3 miles too late! 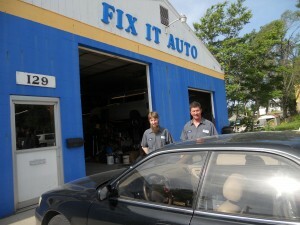 In the 173,000 miles Bing drove his Lexus he spent $8363.83 in repair, most of it at Fix It Auto. The average cost per mile to maintain the vehicle was 4.83 cents per mile! Here I am with the Lexus the day it hit 300,000. I asked my wife to take my picture. I’m easily entertained. He recently had Fit It Auto replace the timing belt, valve cover and oil pressure sensor, preparing for the next hurdle: 333,333 miles or 1/3 of a million! After the oil leakage work the car is getting 2500 miles on quart of oil. Mr. Wall is ready to go. He expresses his thanks to his friends and the hard workers at Fix It Auto and recommends their service to keep your cars running! You can reach Fix It Auto at 515-232-9398. Thanks, Guys, for your hard work! To see Dr. Bing’s other blogs on money and marriage click here.